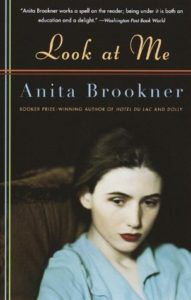 Brookner’s precise and darkly imaginative second novel explores, with an unstinting, dispassionate, and bone-scraping precision, the paradoxical and painful dichotomy between seeing and being seen. Fanny Hinton, a handsome and sober young woman of means living alone with the aging family housemaid in the large London home of her childhood after her parents have died, spends her days in a medical library cataloging images of psychological states from art and antiquity. Although apparently doing everything she can not to be seen, Fanny secretly desires to be a participant in life, rather than simply an observer; she wants to be the one greedily and unselfconsciously eating the peach. In the meantime, she finds that recording acute observations of the people around her provides some sense of relief from the oppression – the “claustration” – of her circumscribed life. When she achieves some success with the publication of a few of her short stories, she finds a measure of contentedness in the recognition, and sees a future vindicated in this mode of being seen, although it requires that she remain the observer, forever on the sidelines, watching and writing. Perhaps one day, Fanny thinks, she could achieve that sort of minor fame reserved for female novelists with acute perceptive abilities. Brookner is nothing if not wry. A young, charismatic, and attractive psychologist from work named Nick and his glamorous wife Alix upset Fanny’s delicately balanced life on the sidelines when they adopt her as a friend. Fanny, in her idolization of the beautiful couple, and in her intoxication with their attentions, begins to believe that she might just have a seat at the rich banquet table of life. All of Fanny’s staid dreams of minor literary celebrity soon vanish as she envisions a future of richer fare — movie nights, eating out in restaurants, and perhaps even a love interest arranged by Alix. In reality, Nick and Alix sound like crashing, narcissistic boors, callously playing with the little mouse/toy Fanny until they tire of her and toss her away. Fanny desperately tries to comprehend the situation in which she finds herself, but cannot see past the categories she has assigned to her friends and colleagues. Nor can she break the constraints of good manners, or of the fear of real answers that proscribe her from asking certain questions directly. Fanny’s naked and immense desire for approbation — and for a seat at the table — is excruciatingly heart-breaking, and seems to represent, to this reader, at least, an eternal truth of the human heart. This entry was posted in fiction, novels and tagged art, artist journey, english literature, identity, london, love, women writers. Bookmark the permalink.